LONG WAY UP – Northern Tablelands MP Adam Marshall steels himself to abseil from Moree’s B&W Silo for charity on June 18. 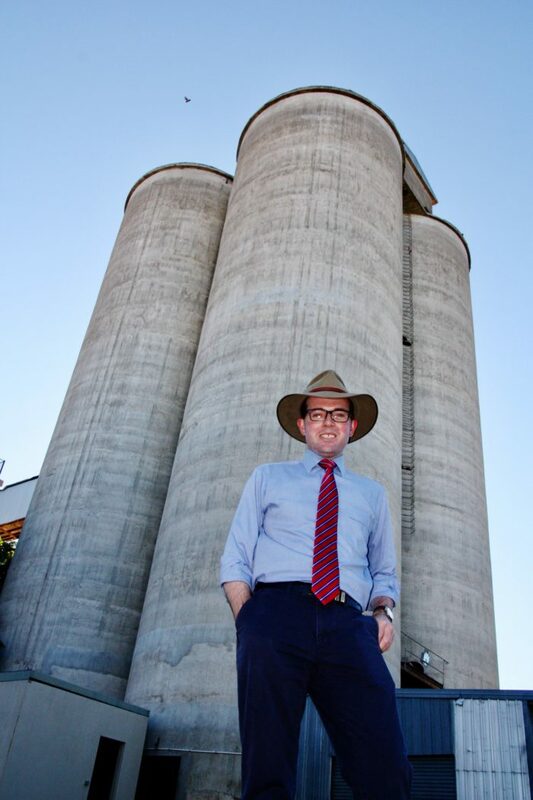 NORTHERN Tablelands MP Adam Marshall is just days away from leaping from the top of Moree’s iconic B&W Rural silos – the old flour mill – and he needs your help to do it. The typically grounded parliamentarian is undertaking the heart-pumping manoeuvre on Sunday, 18 June, as part of the Leaders’ Leap; where 10 high profile figures in Moree will abseil down the nine-storey silo to raise funds for the region’s Westpac Rescue Helicopter Service. Mr Marshall said that while he didn’t usual dabble in any adrenaline junkie activities, he couldn’t turn down the invitation to raise funds for an essential service for the region. “I went and sat down at the bottom of the silo when I was in Moree last Friday and looked all the way up to the top – and thought to myself, ‘crikey, that’s a long way’,” Mr Marshall chuckled. “Mind you, there’s nothing like a hit of adrenalin to let you know that you’re alive. It’s all for an extremely good cause, though, and hopefully a lot of money will be raised. Mr rash all said the Westpac Rescue Helicopter and staff did tremendous job servicing the region, providing urgent medical care to save dozens of lives each year. “Just last week we saw two people winched out of intense scrub after becoming lost and stuck near Dangar Falls. If those brave paramedics can winch into rough conditions to save lives – I’m sure I too can dangle from a rope to help support them,” he said. Mr Marshall will be joined by leaders from Moree’s industry, council, businesses and local police command, among others. They hope to raise $2,000 each, funding the vital service to the tune of $20,000. “We’ll soon see a bigger, better equipped helicopter servicing the region – and community donations are essential to making sure it’s able to provide essential care at no cost to the patient,” Mr Marshall said.